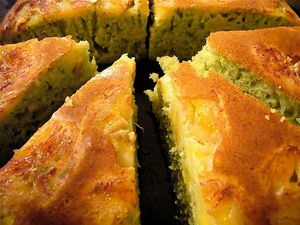 This Breton butter cake is a classic dessert in Brittany. Kouign amann means "bread and butter," and if bread is the staff of life, then this special bread is certainly gilding the lily! Rich with butter and sugar, this cake needs no adornment whatsoever, although berries or whipped cream make for a special treat. Sprinkle the yeast and 1 teaspoon sugar over the warm water and allow the yeast to dissolve for 5 minutes. Stir the flour into the yeast mixture until it forms a smooth, thick dough. On a lightly floured surface, roll and stretch the dough into a large rectangle, about 9-inches by 13-inches. Dot the surface with 1/4 cup of the cold butter and sprinkle it with 1/4 cup of sugar. Fold the dough into quarters. Repeat the rolling and folding process again, three times. Preheat an oven to 350F. Once the dough is folded into quarters the last time, fit it into a greased 9-inch round baking pan. Brush the surface of the dough with the egg yolk, sprinkle with the remaining 1/4 cup sugar, and bake it for 25 to 30 minutes, until it turns golden brown. Allow the butter cake to cool in the pan for 10 minutes, run a thin, offset spatula or knife around the edges of the cake, and remove the cake from the baking pan. Serve the cake warm with berries or cream.